This entry was posted in ICT4D on May 19, 2017 by Victor de Boer. 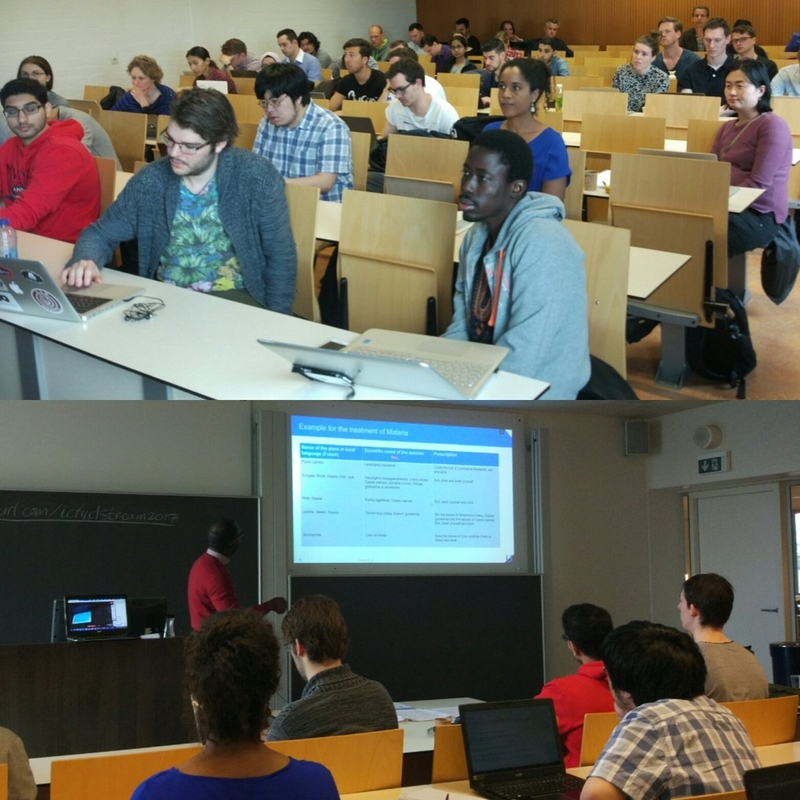 Yesterday, 18 May 2017, the 4th International ICT4D symposium was held at Vrije Universiteit Amsterdam. The event was organized by the W4RA team and supported by VU Network Institute, the Netherlands Research School for Information and Knowledge Systems SIKS, VU Computer Science Department and VU International Office. Invited speakers from Ghana, France and the Netherlands highlighted this year’s theme was “Sustainability and ICT4D”. Keynote speaker Gayo Diallo from Universite de Bordeaux discussed the possibilities of ICT for African Traditional Medicine (ATM). In his talk, he showed how semantic web technologies can play a role here to connect heterogeneous datasets for analytics and end-user services. Such services would need to be based on voice-interaction and localized technologies. His slides can be found here. Chris van Aart from 2Coolmonkeys discussed a number of smartphone applications developed in the context of W4RA activities, including Mr. Jiri a tree-counting application. He proved there is a market for such applications in the African context (Slides). The presentations of the day can be found through the links above. The entire symposium was live-streamed and you can watch it all on youtube or below. 6m19 Dr. Gayo Diallo – Université de Bordeaux (FR): Towards a Digital African Traditional Healthcare using Semantic Web. 56m28 Dr. Chris van Aart – 2CoolMonkeys BV (NL) : Developing Smartphone Apps for African farmers. 1h52m00 Francis Dittoh – University for Development Studies (Ghana): ICT business development in rural Africa. 2h23m00 Wendelien Tuyp – CIS-VU : Sustainable Community Initiatives and African Farmer Innovation.